This past four months has passed so quickly. The Principled Art Show at the Tointon Gallery in Greeley was hung exhibited and taken down! We, the artists, feel it was a success! There were discussions about taking on a third part of this exploration into design. We'll see if the group decides to pursue it. I for one really appreciate the incentive to produce that results from having some pending event on the calendar. I was accepted to show at the 2018 Governor's Art Show! This is a great honor as over 350 some artists applied and only 56 were accepted. Some amazingly talented people were rejected. I'm feeling extremely blessed for this opportunity. The National Greeley Art Exhibition is happening again in April this year. I no longer sit on the Board of Directors for this 501 C 3 event. So other than volunteering to hang the work, I have some freedom to participate as an artist. I was also honored to be juried into this show again this year. November 2017 - Almost Winter Again! The early summer began with a great painting trip with fellow Elemental artist, Berndt Savig and his college art buddy, Saul Maurer (www.saulmaurer.com) to western Colorado near where the Colorado River gets ready to pass into Utah. The quiet beauty was inspirational and I have many studies and paintings that will be showing up in galleries and shows in the near future. But then, summer got really busy. And now I check the calendar to realize that fall is here and winter approaches! The result is that fall has been a bit like when my palette gets messy! After the May trip, the summer was filled with an intensive 8 week online training class on how to teach - you guessed it! - an online painting class at Aims Community College. That didn't leave a lot of time for painting but it did help me be ready for the Fall Hybrid Painting class! However, some of the painting and critique activities I planned weren't quite right. Either too extensive or too much time required away from the students' painting. To add to the "messy palette," this Fall has brought with it the final steps and painting for the next stage of the "Elemental" art show. This time we have turned our creative focus onto the principles of design. Each of the same five artists has produced one work for each of the selected principles. Again our curator will tie all of the parts together with descriptions and commentary. As in last time, we have been a bit innovative with what we are considering to be the design components. But no "spoilers" here! You'll have to check in when the show opens. This spring has brought a frantic pace to my work days! The jury for the 2017 Governor's Art Show honored me by accepting my work. The show opens up on April 28th. Mark Bailey, also showing work and who has received awards at the Governor's Art Show in the past, was selected as the juror for the National Greeley Art Exhibition. As a board member for the NGAE, I have enjoyed working with Mark. I chair the scholarship committee for this organization. The NGAE show also opens on April 28th! So after I award the NGAE scholarship choices and Mark awards the ribbons for the art show, we will make our way to the Governor's Art Show in Loveland. The following two days, I will help my co-curators hang the 30th Garden Show at the Madison and Main Gallery (the coop gallery in downtown Greeley). That show opens on May 5 and will feature work by 11 of my advanced students from Aims Community College. Along with all of these activities, I am still working on the pieces for the Principled Art Show due to hang in December 2017 at the Union Colony Civic Center in downtown Greeley. Hope you will check out these events! It is the final weekend of January! There is a flurry (notice the snow reference) of art activity! My teaching schedule at the local community college has resumed with two drawing classes and an evening painting class. I have been working to produce the next seven pieces for Part II of the "Elemental 2015" show called "Principled" which will be hung in December 2017 at the Greeley Tointon Gallery located at the Union Colony Civic Center. I was honored to have been accepted into the 2017 Governor's Art Show opening April 28 at the Loveland Museum Gallery. My studio schedule also includes producing 4 pieces for that exhibit. On top of all of this, I am on the Board of Directors for the National Greeley Art Exhibition which opens on April 28 at the Union Colony Civic Center in Greeley, Colorado. I am in charge of coordinating the awarding of scholarships and fellowships funded by the sales at the show. Yet one more thing happens in late April, Madison and Main Gallery the small cooperative gallery that I am a member of will have its 28th Garden Show. Katie Caro and I are co-curators for that show! Fall 2016 - About the Business of Art! We are taking the "Elemental" show on the road and will hang it in January of 2017 at the Parker Arts, Culture, and Event Center (PACE). I have new pieces hanging at the Madison and Main Gallery in Greeley and the Columbine Gallery in Loveland, Colorado. This summer was filled with a 17 day trip to Alaska to celebrate 40 years of marriage with my best friend and companion, Deborah! Needless to say, a great number of the images that will show up on my canvases this coming year will be inspired by the spectacular scenes of that portion of our world. Yesterday, I helped hang some amazingly gorgeous art work for the 50th Anniversary show of the NGAE! We have hung 100 pieces from approximately 60 different artists from across the country. Additionally, there are works from 9 past featured artists on exhibit. I happen to be one of those! The 4 watercolor pieces displayed by Don Weller, the show's juror, are spectacular. Wow! The show is a fundraiser for scholarships and fellowships awarded every year. This year we increased our scholarships and fellowships from $1500 to $3400. Even the awards for "best works " of art increased in amount! I am hoping that there are a lot of sales so that next year we will be able to fund even more scholarships. That's French for "What you won't see at the Governor's Art Show!" Having not been accepted into the 2016 Governor's Art Show at the Loveland Museum Gallery, I was one of the artists who chose to submit work to be shown at the Salon Des Refuses show held at the same time as the Governor's Art Show - May 2 - 31, 2016. 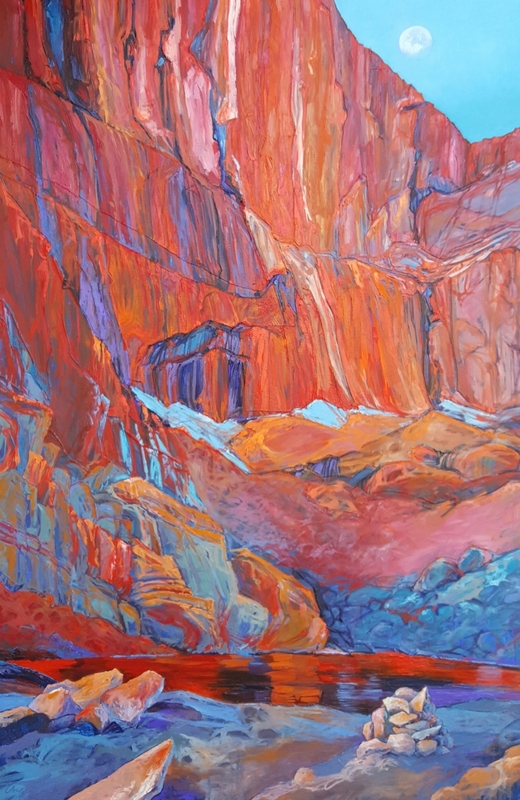 My painting, "Glenwood Canyon in Morning Light," will be hung at Dicken's Alley at 238 E. 4th Street in downtown Loveland. Thanks to Carolyn Pearce and Billi Jean Colson for all of their work in putting this show together. Springing into another surge of PAINTING! It is snowing outside! Classes at the college I teach at were canceled today! But this gives me a chance to get caught up on this blog! March 2016: There are quite a few art shows opening up this spring. Not having been accepted to the 2016 Governor's Art Show (bummer) I was accepted to the "Salon de Refuses" show in Loveland for the many people who were not accepted. 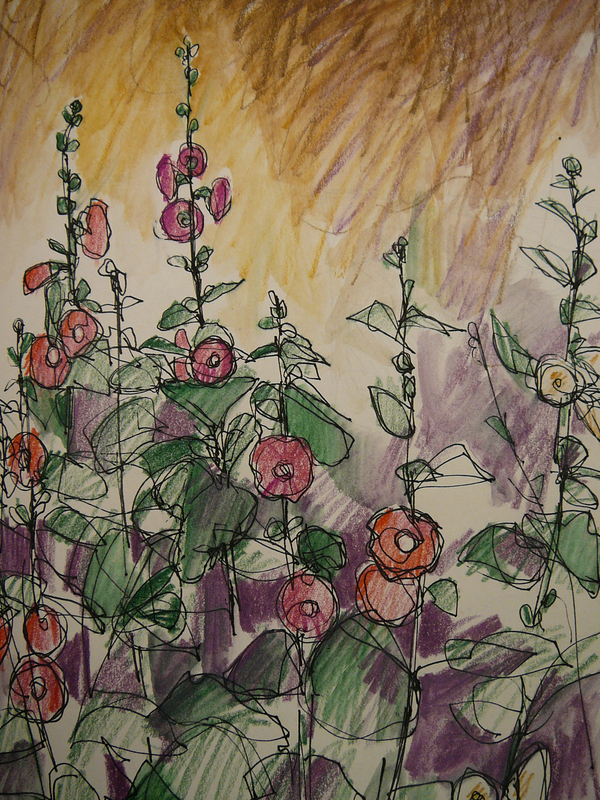 The National Greeley Art Exhibit (NGAE) will celebrate its 50th Anniversary this year. They have invited past "featured artists" to submit two pieces to this show on the first weekend of May. As a past featured artist I have submitted the smaller works from the 2015 Governor's show, "Cactus and Flowers" and "Things Fall Apart." Both of these pieces can be seen on the "works" section of this site. I have stretched 3 large canvases that are ready for gesso. They will be a vertical triptych intended to replace the large "Cairn at Long's Chasm Lake" work that was sold from the "Elemental" show. As part of the 2015 Governor's Art Show, this Sunday morning from 9:00am to 11:00am fifteen artists from that show will paint on location at the Osborn Centennial Farm located just north of Colorado highway 502 on Boise Avenue in Loveland, Colorado. I will be one of those artists! We will have two hours to paint, one hour to frame the piece, and then the works will be auctioned off to benefit the Loveland Rotary International organization. I encourage you to make your way out to see how fifteen different artists can approach a similar subject matter in a variety of ways! Fresh Paint and Current News! 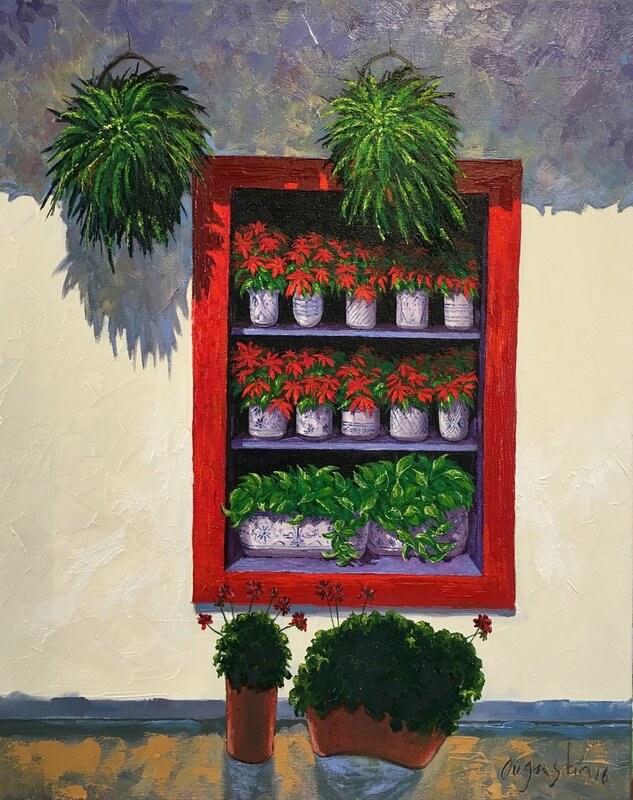 This window of flowers was inspired by a photo that our good friends, Pam and Craig Hansen, took while on vacation in Mexico. I was struck by the near formal balance and strong lighting. Where the photo had poinsettias at the end of their season, I painted them in full bloom. This painting of quince was created for the Madison and Main Gallery's 2016 "Garden Show." Each gallery artist was assigned a different letter of the alphabet to produce a piece of work around. This allowed the visitors to stroll the gallery while doing a letter search. The letter I drew was "Q." This painting was one of the four that I exhibited at the 2015 Governor's Art Show in Loveland, Colorado. The cactus scene was inspired by a large cluster of prickly pear cactus in Old Town Albuquerque. Contact Daniel Augenstein through the Columbine Gallery in Loveland Colorado. Augenstein's art can be viewed in person at the Madison and Main Gallery located in downtown Greeley, Colorado at 927 16th Street AND at the Columbine Gallery located in Loveland, Colorado at 2683 N. Taft.